Download 2016 could have been the wettest in the festival’s history, according to Met Office figures. 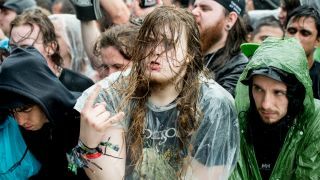 While the official figure for the weekend’s festival – headlined by Rammstein, Black Sabbath and Iron Maiden – is slightly lower than that recorded in 2015, weather experts at the Met Office say the localised downpour that hit Donington on Friday may not have been picked up by their equipment. Officially, 40.6mm of rain fell at Donington between the start of the festival on Friday and last night’s Iron Maiden closing set. In 2015, 40.8mm fell over the three days of Download. But Friday’s torrential downpour which saw campsites and carparks drenched was so localised that the Met Office’s nearest weather recording site at Sutton Bonington might not have captured it. Met Office Meteorologist Alexander Burkill tells TeamRock: “Last year appears wetter, but I feel this may be misleading as some heavy bursts affected the festival itself, which may not have been picked up at the Sutton Bonington site. More heavy rain on Saturday caused further problems on Sunday, with Download organisers having to open additional entrances to carparks to ease traffic congestion around the site. Some festival-goers and artists reported being stuck in traffic for hours on their way to Donington. But the weather did little to dampen the spirits of those on site, who were thankfully not hit with cold temperatures at the weekend. Between them, 2015 and 2016 were by far and away the wettest Download festivals in the event’s 14-year history. The inaugural Download in 2003 saw 30.6mm rain fall at what was then a two-day event. Only two other festivals between then and 2015 reached double figures in terms of rainfall – 11.4mm in 2010 and 11.8mm in 2011.